Impact Wrestling and MLW will go head-to-head at United We Stand. Impact Wrestling will present two separate PPVs in the month of April. Up first for the promotion is United We Stand on April 4th from Rahway, New Jersey. Impact will then look to Toronto’s Rebel Nightclub where they will present Rebellion on April 28th. 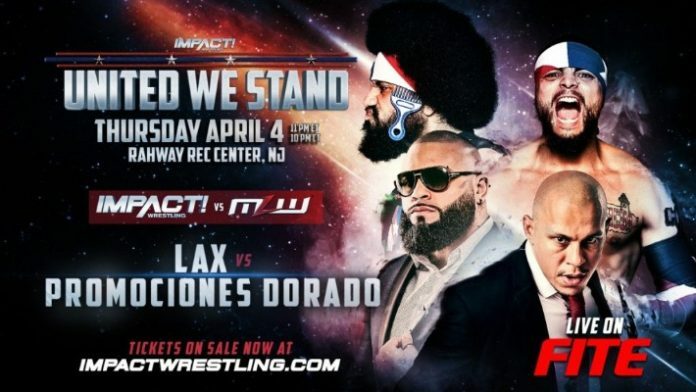 On the most recent edition of the Impact Wrestling Press Pass, X-Division pioneer Low-Ki, issued a challenge to former Impact tag team champions, LAX for United We Stand. It will be Low-Ki’s stable from MLW, Promociones Dorado, going up against Santana & Ortiz. Ricky Martinez and Low-Ki will represent Salina De La Renta’s MLW faction at the event. Low-Ki recently held the MLW World Heavyweight Championship for a period of 255 days. He lost the title to Tom Lawlor last month in the 2300 Arena. Lawler then defeated Low-Ki in his first title defense this month inside Chicago’s Cicero Stadium.